I can't believe I'm into my fifth year with this blog. In the beginning, I started it for two main reasons: 1) to keep myself in the habit of writing semi-regularly, and 2) to have a space to express myself whenever I had things I wanted to say but no one to say them to. Now, I find myself rarely ever having things I actually want to say, and instead I'm stretching to find things to say just so that I'll have things to fill this space with. Madness. I watched my first episode of The Jerry Springer Show today. Not the full episode, but I tuned in randomly about halfway in, and, well, I did not change the channel until it was over. The guest was a young black man who lived with his girlfriend and her mother. He said he was on the show to reveal that he had been cheating on his girlfriend with a friend of hers. Also, he had (bleep)ed the mother. Apparently, the mother had been giving him a hard time for not helping out enough around the house, so he opted to earn his keep by (bleep)ing her. He seemed to enjoy talking about it. They then brought in the girlfriend to confront her man. She was quite angry. He told her she was too bossy and never listened to him. Also, he said she was violent. Jerry asked if that was true. She admitted to having thrown things at him and maybe stabbing him, but she explained that she couldn't control that. Then the mother came in and got yelled at by her daughter. The mother said her daughter should have listened to her when she told her before that this guy was no good. She said the daughter wouldn't listen to her, even though she only wanted daughter not to end up like mother. As for why she let the guy (bleep) her, the mother said it "just happened." The friend--the one the guy had been cheating on his girlfriend with--was then brought in. Almost immediately, the two young women started shoving one another. Somewhere a bell rang, and the audience began chanting "Je-rry! Je-rry!" After a commercial break, audience members were allowed to make comments at the guests. A blonde lady, speaking to the mother, said that a mother is supposed to take care of her kids. Then the blonde lady flashed the audience and said, "I want my (bleep)," whereupon someone threw beads at her. Finally, Jerry made some closing remarks. He was sharp, eloquent, generally perceptive. The show was pretty much everything I would have expected it to be, based on all I'd heard about it during its period of immense popularity some fifteen years ago. Maybe the fighting was tamer than at the show's peak. Mostly, the experience made me wonder how the show was such a sensation in the first place--enough of a trending topic that, even though I had never seen the show itself, I could recognize and understand the constant references to it on the prime-time and late-night shows that I did watch. I was only watching it now because I'm unemployed. Was there a period of widespread unemployment some fifteen years ago that similarly led huge numbers of people to tune in during the day? 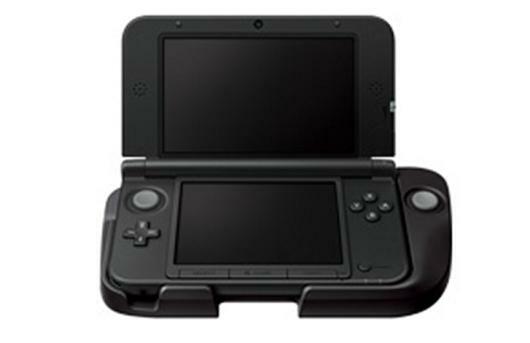 That's the recently released Nintendo 3DS XL with a coming-soon-to-Japan XL version of the Circle Pad Pro. Makes me so mad just to look at that picture, and I hope the reasons why are obvious, because I'm far too exhausted by my own anger even to complain at length over Nintendo's shenanigans. In other news, after about 6 years, my DS Lite looks to be facing the end of its life. Since yesterday, the touchscreen has taken to shaking quite violently. Sony and Microsoft get a bad rap; it's only ever the Nintendo systems that crap out on me. First it was an OG Game Boy, then a GameCube, now this. So Resident Evil 6 is getting totally savaged on Metacritic--critics and users alike. I myself played the demo and didn't like it. Even so, I picked it up at retail day-one because . . . well, let's be honest, I'll buy crap just to have it, so long as it has "Resident Evil" on the cover. To be specific, I even paid the $30 premium for the "Archives" edition for 360, which bundles in Resident Evil Code: Veronica X HD, Resident Evil 4 HD, Resident Evil 5 Gold Edition, and the Resident Evil Degeneration movie. Degeneration is dreadful and, on its own, not worth paying for at any price; you can just consider it a bonus in this package. But each of those games normally goes for around $20 (about $10 too much for CVX), so if you don't already have more than one of them, then the bundle is not a bad deal (that is, provided you still want and intend to play RE6 itself sooner rather than later). That said, Resident Evil 6 Archives is surprisingly quite the opposite of a conventional "collector's edition"--probably not the sort of item you'd be happy with if you're buying things just to have them. If it proves to be rare, then I suppose that in itself will make it a collectible. But it's a very unattractive and cheaply put-together package. RE6 already has some of the more boring box art in recent memory, and the Archives cover is a possibly even less inspiring grayscale version of the same, only with the words "Archives" and "Includes" above a list of all the titles included. At least it has a slipcover, though it's the same and just as tacky as the front of the case. So, yeah, it all sounds pretty disgusting, doesn't it? Well, the package makes for an unquestionably lame collectible. On the other hand, I'm lately starting to feel that, price being equal, the digital versions of games in many ways hold more practical value for me than physical media. The convenience of being able to load games right off the hard drive, instead of popping discs in and out of the tray every time you want to switch games, is not to be underestimated. Yes, essentially, not only am I a wasteful spender, but I'm also lazy. But the reality is that the majority of the games I've played on the 360 over the last year have been off the hard drive, and that comfort is certainly something I've come to appreciate. Also--and I'm being completely serious here--I've had multiple occasions when, on a whim, I would load up a game on my already-on 360. Meanwhile, walking over to my games shelf, picking out a game, and then inserting it into the console is not something that I would ever do on a whim. And, as I am these days an increasingly more casual player, my gaming almost depends primarily on whims to initiate. In fact, I honestly wish that the included RE6 were a download as well. Certainly, the overall cheapness of this bundle makes me wish they had simply gone all the way and made it nothing but codes on a sheet inside that crappy box. Even setting aside the underwhelming physical component to this specific release, however, going all-digital is something that, more and more, I feel I can really get behind. It's convenient, saves shelf space, and is more secure in a way, since you can usually re-download even if your hard drive fails, whereas if something happens to your disc, you're screwed. Sony made a big deal recently of its being able to offer downloadable versions of RE6 and other major titles simultaneous with their retail releases. Had that been an option on the 360, I would seriously have considered it for RE6. Aside from my collector's mentality, which is largely mooted here by the lame cover art and lack of manual, the only real argument for the physical version is that Archives is the better value and, ironically, only available at retail. On that note, it's worth mentioning that, for the same price as Archives, you can get its PS3 counterpart, Resident Evil 6 Anthology, which swaps out CVX and Degeneration (the weaker parts of Archives) for downloadable PS1 versions of RE Director's Cut, RE2, and RE3. Outside of this bundle, those games would collectively cost you about the same as CVX + Degeneration, but they're probably more worth your time.